Genoa is a historical port city in northern Italy and the capital of the Region of Liguria. It has grown into a popular tourist destination, although it is often overlooked for more famous cities such as Rome or Venice. Still, for the travelers who spend time here, it is an unforgettable place to visit. It has quaint alleyways, delicious food, and many interesting and historic sights. It's a wonderful place to wander around and experience a quintessential Italy city. 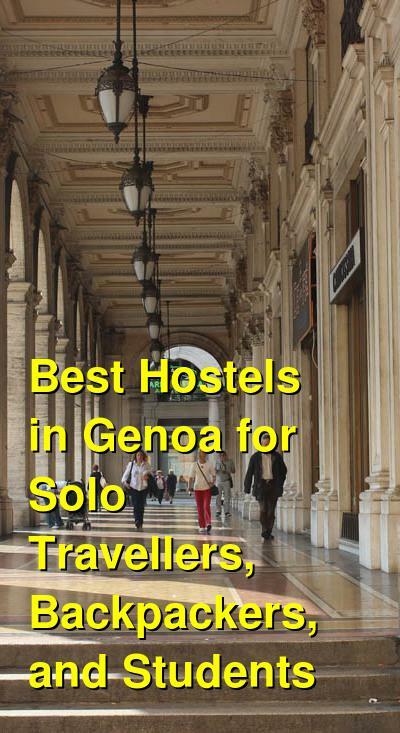 There are several great hostels around Genoa. If you're looking for a smaller and more personal place to stay, there are a few good places in and near the Old Town. Larger hostels and hotels are located a little more outside of the Old Town, but many are still just a short walk away. How much do hostels in Genoa cost? A good hostel for solo travellers, students, couples, groups, and families. This hostel offers guests a fun and comfortable place to stay. It's designed with traditional Genoese elements including frescos on the ceilings and a historic fireplace in the kitchen. The hostel has large windows that let in a lot of natural light. OStellin is centrally located near everything that you could want to see or do in the area. It's perfect for all types of travelers, whether you're a young backpacker, an exchange student, a family, couple, or small group. It's also a great option for both long and short term visitors. The hostel is small with only four rooms to choose from. There are two dorms that sleep up to eight guests, one seven bed dorm, and a private double room. Breakfast is included in the price of the room. This hostel has a personal feel and you'll enjoy getting to know the owner. There's a nice kitchen which guests can use, and you'll quickly feel right at home here. Manena Hostel is another good place to stay in Genoa. It's located right inside the UNESCO Old Town area and it is a friendly and welcoming place to base yourself. The staff is great and they'll give you free maps and travel information when you arrive. They also offer regular free walking tours of the area and they know all of the best places to visit for history, art, shopping, and nightlife. This hostel is a comfortable and relaxing place to stay. The beds are comfortable and the atmosphere is mellow. There are five, eight, and twelve bed dorms that you can choose from and there's a nice common area where many guests enjoy hanging out and getting to know each other. It's not uncommon for guests to head out on the town together. This is one of those rare hostels where you'll quickly feel like everyone is part of the family. The staff and other guests all seem to mesh well and you'll quickly make a few new friends. Abbey Hostel is the original hostel that later grew into "The Hostel" chain. It's located in an ex convent that dates back to the 1400s but today it is a welcoming place where visitors come from around the world. It opened in 2014 and it can sleep up to 41 people. There are both dorms and private rooms available. Dorms have either four or seven beds and private rooms include singles, twins, and doubles. There is also plenty of common space where guests can relax and hang out. This hostel is located in the historic heart of Genoa. 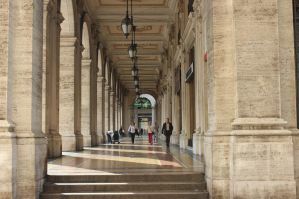 It's not far from the Piazza Principe Railway Station. It's also just a couple minutes from the famous Via Garibaldi, which is where you'll find many of the area's most historic buildings. Also nearby is restaurants, cafes, grocery stores, and shopping. If you're looking for comfort, affordability, and a central location, then this hostel is an excellent option. Castle Hostel is another hostel in "The Hostel" chain. It's located in a fifteenth century building and is surrounded by the beautiful green space of Castelletto. It's still relatively close to the city center and is a fifteen minute walk from Piazza della Nunziata, Acquario di Genova, Porto Antico, and Piazza Principe train station. The hostel has all of the standard amenities available including city maps, travel information, and a social setting. There are dorms available as well as single and double private rooms. Dorms sleep four, five, or six people. If you want a relaxing place where you can meet other travelers then this is a good option. It's a larger hostel so there always seems to be people around to hang out with. It's a great option whether you're traveling alone and want to make a few friends, or traveling with a group and want a little space. There's plenty of common space where guests can hang out as well.